As this sudden and unexpected bullish trend continues to make headlines, it remains interesting to take a closer look at individual market trends. Albeit most top markets perform rather well at this time, it seems the EOS price is struggling to keep up. While its gains are nothing to sneeze at by any means, it is evident some of its market cap range “competitors’ are having more success. A lot of people are genuinely wondering how long this Bitcoin momentum can remain in place. With a near 26% gain in the past few days, it is evident this bull run has grown well beyond proportions. That is not necessarily a bad thing by any means, but it will be intriguing to see how all markets respond to this challenge over the coming days and weeks. As far as the EOS price is concerned, the current uptrend isn’t half bad, but not overly impressive either. A 15% rise in USD value means one EOS is priced at $5.47. There is also a 6.15% gain in EOS/BTC, bringing that ratio to 0.00106 BTC again. Both trends are more than acceptable, but they are far less significant compared to Litecoin, Bitcoin Cash, and several other markets. Changing that scenario will not be all that easy. On social media, there have always been some very interesting discussions pertaining to EOS. C4Chaos, for example, is wondering why anyone would use either XRP or Bitcoin Cash, in terms of sending transactions with a fee when EOS can do it without additional costs. An interesting sentiment, albeit there is a case to be made for using most of the top currencies, tokens, and assets for regular transactions these days. When it comes to the current dApp ecosystem, there has been significant growth for both EOS and Tron these days. Of the top applications, half of them belong to the EOS ecosystem, which is rather intriguing. It is evident there will be some fierce competition with Tron in this department. Even so, there is no sign of Ethereum-based dApps in the top 10 right now, which is rather telling. Half of the top 10 DApps belong to #Tron, while the other half belong to #EOS. 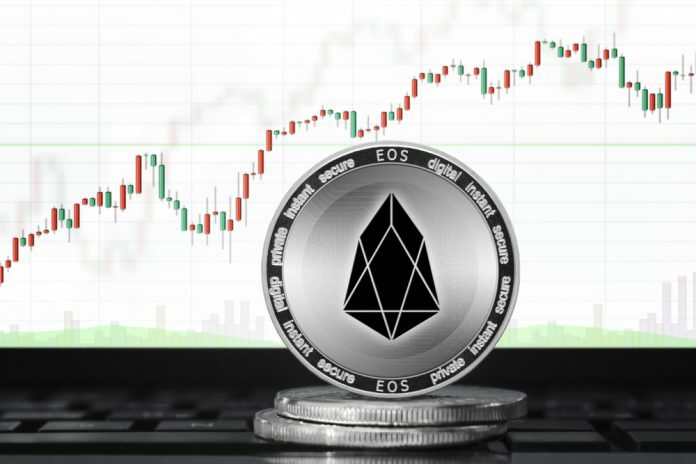 There is also some growing dismay regarding Coinbase’s reluctance to enable EOS trading at this time. Although that is not too surprising by any means, one has to keep in mind the company will keep adding more offerings as time progresses. Whether or not EOS will ever be officially supported, is difficult to predict. Logic would say that will be the case, but cryptocurrency is not always a rational industry. When looking at the bigger picture, it is obvious this EOS bull run will fall apart of Bitcoin reverses course. The world’s leading cryptocurrency has shown no signs of doing so, but that doesn’t mean it won’t happen in the near future. This massive industry-wide uptrend will be met with a correction of sorts sooner or later. When that will happen, all markets need to buckle up to prepare for the worst.